Let’s admit, eating carrots for a snack is not something that majority of kids would do. Not to mention eating carrots as a treat. 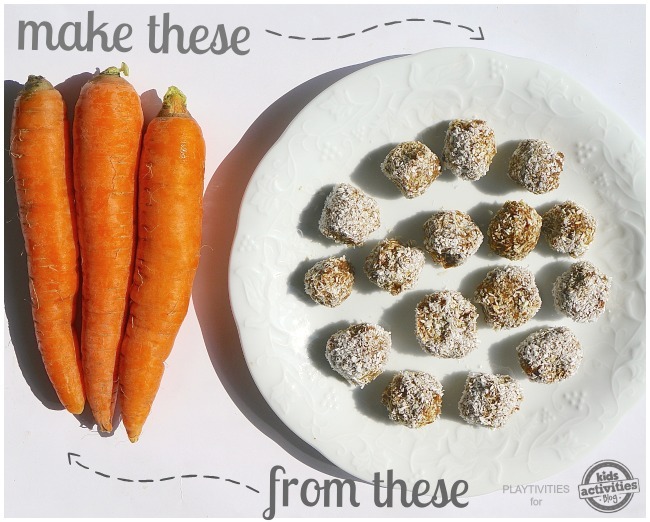 How about making a sweet AND healthy treat for your kiddos with carrots? Wait! It gets even better. It’s fast, easy and it doesn’t require baking or cooking. Have you ever ate a carrot cake and didn’t even tell it had carrots in it? 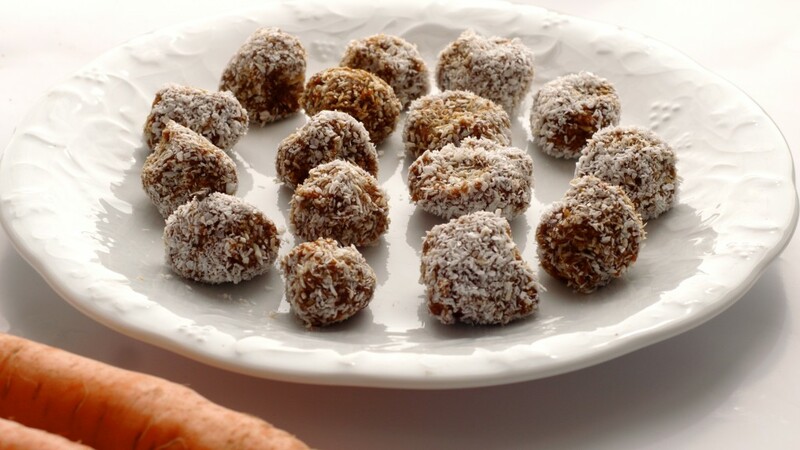 Well, these homemade carrot balls are the same. You (especially KIDS) won’t be able to tell what’s in it, so use this opportunity and put the healthiest things that kids would normally wouldn’t eat. 6. Some spices (we love cinnamon and cocoa). These are optional. 2. Put all ingredients into the food processor and let it do its magic for 2 minutes. 3. The mixture should be thick enough to form the balls. That’s where you can ask kids to help. They will love it. 4. Roll the carrot balls into the shredded coconuts that you reserved. 5. Refrigerate overnight (or at least for few hours) before eating. 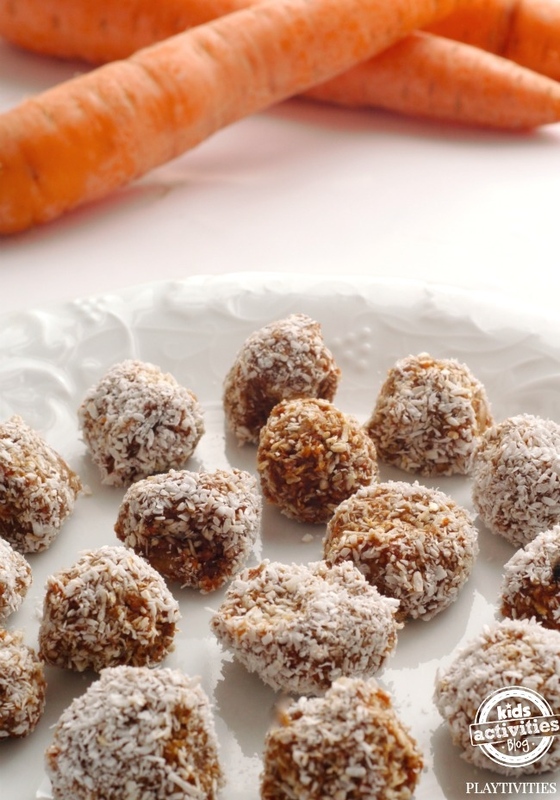 These carrots balls have been very popular in our house last few months. They are go-to treat in the afternoon. I usually double the batch, freeze half of it and keep the other in the fridge. Warning! They go fast. And the best part about it, I like it. They are so healthy, I don’t mind if they eat the whole batch at one sitting. BAM! And that’s how you make your kids eat carrots. 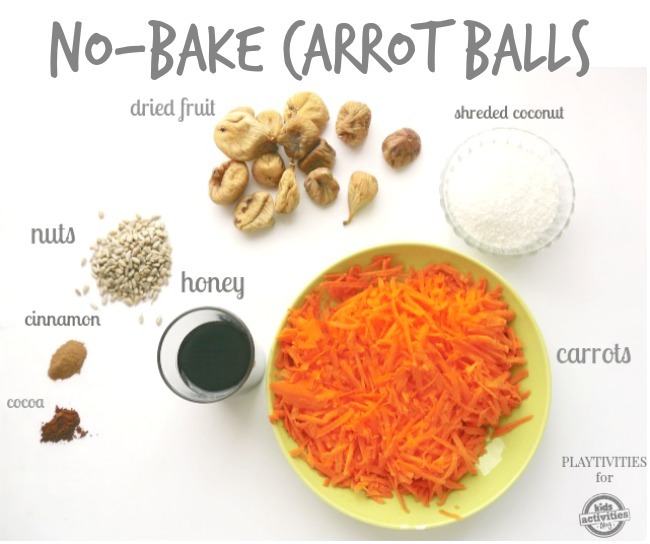 Keep in mind these carrot ball snacks are very customizable. I hope you and the kids will enjoy these healthy carrot snacks. Want more healthy snacks for kids?